Is peppermint oil the same as extract? WE LOVE OUR VITAMIX!!! We use it ALL the time. Can’t wait to see more recipes! I think you can use it the same way, the oil may be more effective because it is really concentrated. I would add the extract and if the taste isn’t strong enough, try more the next time. I was teaching a class a few nights ago and a friend who was in attendance brought up your mint choc chip “ice cream” recipe. Everyone was VERY quick to jot it down! I will give it a try tomorrow……honestly 11:10pm and all, I’d do it tonight if only I had choc. chips in the house! Thank you for all you do here — your story is a beautiful one!!! I love taking a health challenge and making it a catalyst for positive change! You are amazing! Thank you so much for the kind words! 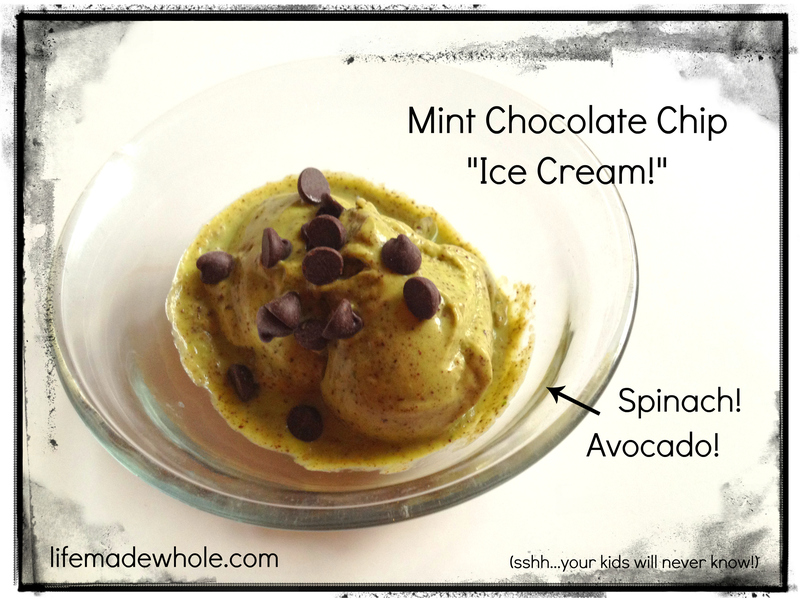 I hope you enjoy the mint chocolate chip “ice cream!” Let me know what you think! Wondering what brand of dark chocolate chips you use and where you get them? Looking for something without GMO – most chocolate contains soy. I buy Chatfield’s from Whole Foods. They have: chocolate liquor, evaporated cane juice and cocoa butter — that’s it! no soy!!! They are expensive, but we don’t use a lot. They have another brand, and I can’t remember the name, but they don’t have soy and are fair trade but they are even more expensive so I don’t get them as often. The Chatfield’s are 70% cacao. These are fairly new to Whole Foods. I used to buy the fair trade chips until these were introduced. Now I switch back and forth, depending how much $ I have! Do you have to have a vitamax to make this?